CARE Grant Case Study: GHD, Inc.
GHD, Inc. engineering firm, in partnership with Humboldt State University, received CARE grant funding to test post-consumer PET carpet for use in civil engineering applications. The work included testing of physical properties as well as testing water quality in contact with post-consumer carpet over time periods between two and six months. The feasibility study revealed three optimal civil applications for PET in the form of post-consumer shredded carpet or carpet fibers. These applications must undergo a Phase II pilot project study before California public projects are feasible. Grant funding covered 100% of the project costs. Designing new equipment for testing physical properties. Trimming carpet into manageable sizes for testing and un-baling carpet fibers for testing. Applications will be new and challenging to market, even if proven. Post-consumer carpet will contain different materials depending on the environments with which it was in contact. More testing is needed to support feasibility study. Finding sources of data and projects similar to this project. There is surprisingly little information relating to reuse of PET carpet fibers and material properties. New applications usually require an understanding of the material in question, and finding the information is a challenge. If the data needed cannot be found, it must be developed. Partnership developed with complementary local university. Funding for testing of more recycled products in the marketplace. CARE connected project to researchers that had tackled similar issues with different material, or same material but for different applications. Also connected project to a chemistry professional to explain chemical makeup of the material to help GHD define knowledge still needed. –Joaquin Wright, Senior Project Engineer, GHD, Inc. Examining existing research on PET carpet properties and its behaviors in civil engineering applications. Securing all equipment/materials and experienced staff. To complete the feasibility study, the project used expertise from civil engineers, environmental engineers, chemistry engineers, construction managers and general contractors familiar with implementation of civil engineering projects. Testing physical properties and quality of water leachate soaked with post-consumer carpet. Comparing water quality tests to California and national maximum contamination levels. Drawing comparisons to recycled tire-derived aggregate. Drawing conclusions regarding optimal civil applications for PET carpet and developing recommendations for next testing steps. Writing draft and final reports. Demonstrating the viability of more environmentally friendly recycled products. A new level of knowledge gained on PET material properties and potential uses. There is now information on material components in various forms, which leads to a much better understanding of what type of products and/or applications may benefit from using different forms of recycled PET carpet. This knowledge allows projects to look toward specific uses which will have a much higher likelihood of adoption in the marketplace and increasing the use of recycled PET content. Carpet Landfill Elimination and Recycling (CLEAR) received a CARE grant to purchase equipment for a new Northern California facility, which would process PET and polypropylene post-consumer carpet fibers. Processed fibers are made into pellets and sold to various companies for automotive, hardware, insulation and other products. CLEAR has also begun processing carpet backing, outside of the grant project scope. ✔ Grant funding covered 25% of the project start-up costs. ✔ Procuring the right equipment of various types. ✔ Finding reasonable space and power. ✔ Finding reasonable distance to raw goods. ✔ Uncertainty, while customers may promise to take all of your goods, partnerships could take years to develop. ✔ A trial run positive result does not guarantee success at a production scale level. ✔ Carpet that was produced 5-20 years ago by various mills is difficult to remanufacture and sell as a consistent product. ✔ CARE technical assistance: CARE facilitates business relationships for facility start-up, product development, and product expansion. ✔ Testing equipment and getting it to work consistently and reliably. ✔ Building product customer base. ✔ 12 million pounds of processed output in first 6 months (as reported by grantee). ✔ 10 new California jobs in first 6 months. ✔ Demonstrated viability of more environmentally friendly feedstock products. ✔ 600,000 MTCO2e, assuming all polypropylene carpet was manufactured into engineered resin. ✔ CARE grants enabled CLEAR to build a line and develop markets for its PCC goods, which are manufactured into new products for sport surfaces, padding, engineered resins and other products. Sierra Mat & Rubber received a CARE grant to begin manufacturing products comprised of post-consumer carpet backing and other recycled materials at its existing Northern California facility. Carpet backing in the form of a calcium carbonate sand is mixed with recycled rubber to manufacture commercial floor mats, landscape pavers, wheel stops and other products. Grant-funded equipment included presses, molds and a calcium carbonate bagger to transport the carpet backing material from the manufacturing facility to various California job sites. Sierra Mat & Rubber also became the first manufacturer of Double GreenTM products, which incorporate post-consumer carpet and one other recycled material. CARE GRANT AMOUNT$218,500 ✔ Grant funding covered 40% of the project start-up costs. ✔ Recycled-content products are new to the market. ✔ Products are still undergoing testing and development. ✔ The largest challenge is the sieve size of the calcium carbonate. The material is fine and dusty. Sierra has changed its existing material handling systems to deal with the dust factor. ✔ Securing continued support for testing and market development. ✔ CARE facilitates business relationships for product line expansion and development. 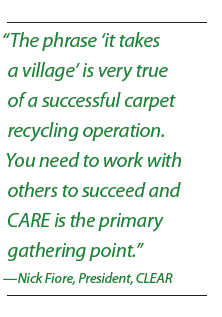 ✔ CARE develops Double GreenTM certification to assist in marketing plan. ✔ A CARE grant has allowed Sierra to lower its raw material cost in order to be more cost-competitive. The equipment has allowed Sierra the ability to produce larger mats, which require more PCC material and enable Sierra to enter commercial markets. ✔ Securing all equipment and additional experienced operations staff. ✔ Testing new products while continuing to manufacture other products that use California-generated post-consumer carpet. ✔ Building product customer base and marketing strategy. ✔ Meeting environmental and product standards. ✔ 1.4 million pounds of recycled output in first 6 months (as reported by grantee). ✔ 4 new California jobs in first 6 months. ✔ Demonstrated viability of more environmentally friendly recycled-content products. ✔ Development of four new products using California-generated post-consumer carpet backing material.